Many people sign up for Twitter accounts and later realize that they would prefer a different username. Perhaps you would prefer a shorter username or one that is more professional. Don’t worry, you can change your Twitter name in a couple easy steps and you can do so to make sure you don’t lose any followers in the process! Once you login simply click the “Gear” icon in the top right corner of the page and scroll down to the settings link. This will bring you to the Account page of your Twitter Settings menu. 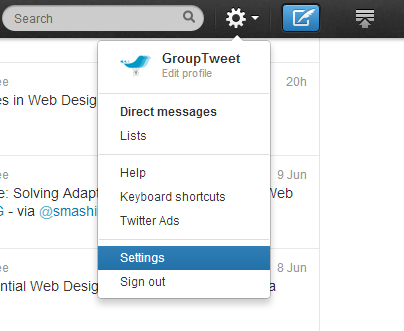 As you can see below, navigate to the “username” field and type in your desired new Twitter name. If the username is taken already, you will be prompted to enter a new one. Once you have found an available Twitter name you like, simply scroll to the bottom of the page and click the “Save Changes” button. If you have built up a sizable follower base, it’s a good idea to reclaim your old username. To do this go ahead and logout of the current twitter account and visit https://twitter.com/signup. On this page, register with all of your info and fill in your old username in the username field. If you get an error saying your email is already registered, don’t worry just use this tip to register with the same Email address. Send a Tweet from your old account something like, “Hi guys, I decided to change my username to @newGroupTweet, you can follow me there!” Now if anyone stumbles upon your old profile, they will see the link to your new account! That’s about it, let us know in the comments if you have any questions!